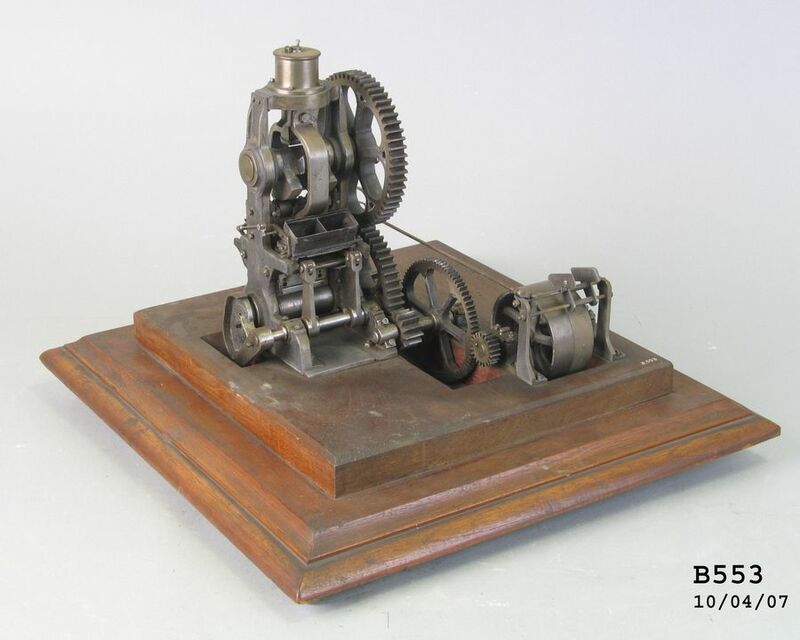 This is a nicely detailed working model of a ‘Platt’ brick press, which was probably powered by a model steam engine via a belt. It features two brick-shaped moulds for holding dry clay while it was subjected to pressure. It represents a major innovation in brick-making, which traditionally used a wet clay slurry, as making bricks with dry clay was quicker and more fuel-efficient. Model belt-driven geared press with moulds for making two bricks by the dry process. It is based on a press made by Platt Bros of Oldham, Englan, UK, a large firm whose main output was machinery for manufacturing textiles. The model was made in 1894 by Mr J Chadwick, who worked at Fowler's Pottery in Parramatta Road, Sydney. He based the model on a brick press then in operation at Fowler's.